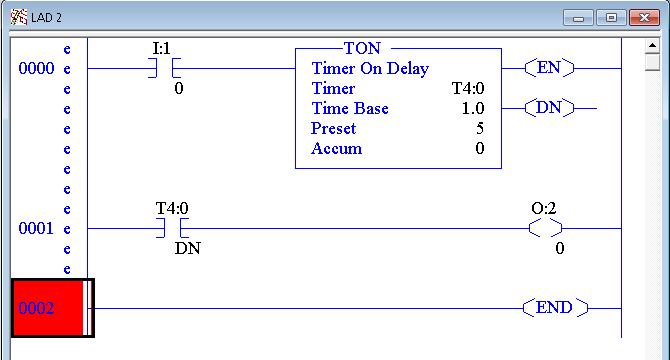 Using the On Delay Timer (TON) in the SLC 500 Processor. The SLC 500 On Delay Timer (TON instruction) can delay an event from taking place. When the run of logic goes true, the EN (Enable) bit goes true. The timer will then start timing (the TT bit goes true). After the accumulated time reaches the preset value, the timer will stop timing, and the DN (Done) bit goes true. One real world example of where a TON instruction will be used include a conveyor system. When a conveyor system is started, you can use the TT bit to sound a horn for a few seconds. This will warn everyone that a conveyor is about to start. When the timer is done, the DN bit goes high. This bit can then be used to start the conveyor. Another example would be an alarm. We don’t want to keep giving the operator nuisance alarms, so you might prove the alarm condition exists for a few seconds, before displaying the alarm to an operator. The default data table for Timers is T4. This data table can hold up to 255 timers. The data table is just a “Workspace” for the timer to operate. Every time we use a new timer, a different element of the data table should be used. 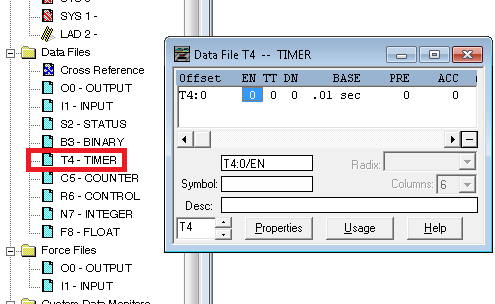 To look at this timer data table, double click on T4 — Timer. By going to “Properties” you can add more elements, so they are available later during online edits. At any point, you can click “Usage” to see what timer elements are already in use by your project. Here we have an example of a TON instruction in logic. Notice we can select a time base. For large amounts of time, you can select a time base of 1. For more precise timing on faster events, you can select a time base of .01. The total time in seconds is equal to the preset multiplied by the time base. Here, we have a delay of 5 seconds. When the input is energized on rung 0, the timer will begin to time. After 5 seconds, the DN Bit is set to a 1. Output 0 will then energize in slot 2. For more information on the SLC 500, visit the SLC Catagory Page!